Like ‘total history’, ‘micro-history’, ‘regional history’ and ‘gender history’, the history of memory is a mode of historical enquiry that aspires not simply to bring new perspectives and research methods to the discipline but to effect a radical re-conceptualisation of the entire enterprise. Simultaneously raising profound criticisms of the manner in which historical writing has been conducted thus far and suggesting exciting possibilities as to how it might be reformed in the future, it has entailed acute ideological and polemical challenges to conventional historiography, which has made it attractive equally to independent thinkers dissatisfied with the epistemological and ideological complacencies of the academic establishment and to opportunist careerists anxious to find their place within it. Like many of such ambitious missions, it has its major origins in France. Its roots may be traced to an insistence on the importance of the distinctive cultures of local or regional communities asserted in the late nineteenth and early twentieth centuries by French historical geographers, sociologists such as Durkheim and Maurice Halbwachs, and (but more tentatively) the historian Lucien Febvre. And its more recent spread of influence in Anglophone culture may be attributed primarily to the work of the French historian Pierre Nora, director of the multi-volume project Les lieux de memoire (7 vols, Paris, 1984–92), which attained especial influence on its appearance in translation as Realms of memory in the later 1990s. As such, when it emerged as an international force in cultural historical studies, it did so retaining distinctive French preoccupations and tensions: the conflict between regional and national identities; between official culture and education and unofficial popular customs and practice; and a post-modernist mistrust of the repressive and hegemonic tendencies of official (particularly academic) forms of knowledge. Because its conceptual and methodological limitations were only a little less obvious than its immediate attractions, applications of the history of memory to Irish history have been intermittent and frequently guarded. Its privileging of local, popular or marginal voices against those accorded influence in state and public records and in academic commentary has enabled substantive as well as rhetorical critiques to be mounted against conventional or established interpretations of crucial events in Irish history from the late eighteenth century on. But equally, because the complexities of Irish constitutional, social and cultural history have been so different from those of France in the same period, simple polarities between locality and metropolis, between élites and masses, and between official and popular forms of cultural expression have been difficult to sustain. And so, while some scholars have made considerable claims concerning the potential of this radically new perspective, many others have cautioned against overstating its value as an antidote to conventional academic history, and no full-dress demonstration of its potential has been attempted. Until now. Guy Beiner’s Remembering the Year of the French is a strikingly ambitious book. It aims not only at recording the way in which the events in Mayo in ’98 were remembered and recorded in popular culture, but also at providing a demonstration of how such audacious interpretative concepts as ‘social memory’ and ‘folk history’ can be effectively and productively applied. The extent to which he has attained both objectives is impressive. Elegantly constructed, lucidly written and inspired, and displaying an inexhaustible capacity for research, Beiner’s work is a rich storehouse of information both empirical and conceptual. His opening section, supplying the theoretical and methodological bases of his approach, is characteristic of the whole. Driven by an intense personal conviction of the value of his approach, it is also acutely sensitive to the problems it entails—the many criticisms raised by sceptics, the many disagreements that have arisen among its proponents, and its own vulnerability to distortion and confusion. Central to the persuasiveness of his case is its very moderation. Eschewing the wilder theoretical extremes of the proponents of folk or collective memory, Beiner relies instead on the concept of ‘social memory’, which is not some unilinear trans-generational phenomenon that he recovers from layers of official repression but a dynamic process that is continually renewed through communications, negotiations and contradictions carried by a wide variety of media, popular and élite, which vary in their influence from time and place. This supple concept has many strengths. It is impossible even for the most radical advocates of memory as an individual experience to deny a social aspect in its formation and development. It provides Beiner with a hermeneutic to open up or re-interrogate sources never before used or used in only one fashion. And, most importantly, it renders his approach resilient in the face of serious empirical criticisms that are implicit in the two other books reviewed here. Micheál Briody’s The Irish Folklore Commision is a book of considerable interest. In detailing the process by which this institution of immense cultural importance developed from a private cultural body into an organ of state and finally into a university research department, he provides a fascinating account of the political, administrative, financial and personality conflicts afflicting the Commission, as well as the ideological and cultural influences that underpinned them. A bureaucratic rather than a cultural or theoretical study, Briody has little to say about how such problems may seriously have affected the character of the material produced, or indeed about the collecting agents’ aims, methods and priorities, a question on which Beiner has interesting but inconclusive observations. But given the suppleness of Beiner’s approach, the effect of Briody’s evidence is largely to supplement Beiner’s analysis of the functioning of social memory rather than to negate it. 1916 in 1966, the product of a Royal Irish Academy research project led and edited by Mary Daly and Margaret O’Callaghan, offers similar challenges and similar supports to the concept of social memory. Though it contains some theoretical writing that does not seriously advance an already rich and sophisticated literature, this is an avowedly empirical work. 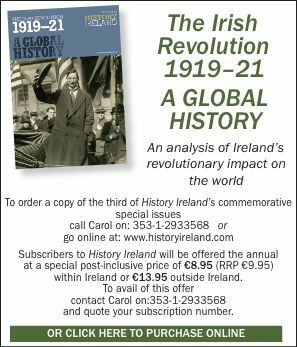 The directors were determined to uncover as much data as possible about the aims and ambitions of the organisers (state and voluntary) of commemoration of the Rising before constructing any more ambitious conclusions concerning its significance. In this admirable aspiration they have been on the whole successful. The lack of a comparative dimension, especially in regard to the forms of commemoration, the Croke Park pageant and the early television ‘docudrama’ Insurrection, is perhaps regrettable. But the volume will long serve as a valuable resource for those interested in the social and cultural history of Ireland in the 1960s. As with Briody’s study, the struggles between the élites and the people, and within the élites themselves, documented in these papers tend to strengthen rather than diminish the case for social memory as a complex construct. But in offering a detailed and altogether darker account of how the processes of communication, negotiation and contradiction occur in the construction of social memory they move into areas left largely untouched by Beiner. One of the least persuasive sections in his book is that which bravely asserts the ‘democratic’ imperative in social memory, which he affirms is a distinct force independent of the creations and manipulations of the élites. His employment of this political term rather than ‘popular’ or ‘communal’ may be an understandable attempt to avoid associations with the excesses of the communal memory theorists. But it is unfortunate, not only when the élite character of the most common media for communication operating within the process—teachers, priests, folklorists, journalists, politicians—is considered, but also when the intense competition between political activists at all levels of society for control of the prize of social memory as documented by the Daly and O’Callaghan project is fully taken into account. There is, for all its sophistication, a residual simplicity in Beiner’s view of the conditions of political and social interaction in rural Ireland that allows him to ascend too easily from the plain of the ordinary people to the metropolitan heights of the élite without ever passing through the valley of the squinting windows. There are, moreover, other forces beyond the political contending against the process of memory, which, I think, have not received due weight in Beiner’s analysis. One, now out of fashion, is the force of religion. With characteristic sensitivity, Beiner is aware of the significance of ghost and fairy stories as media for retaining and transmitting memory, and he has interesting things to say about the different dynamic of the folk calendar. But he gives insufficient consideration to the degree to which the rhythms of religious observance, its daily and weekly routines of Mass, prayer and reflection, as well as its rigorous annual calendar, constituted an opposing vectoral force to the development of social memory, disrupting the accumulation of communal experience by the individual and communal contemplations of eternal life. A second countervailing force is more banal. The American philosopher John Dewey once shrewdly observed that monuments were there not only to help us remember but to prevent us from forgetting. Unless one subscribes to an extreme Freudianism (with all the risks subscription implies for a more eclectic social theory), the capacity for forgetfulness must be conceded as a natural human limitation that is not always the product of selection and repression. As such, memory, when it exists, must be seen as a construct of techniques of selection and expression in the constitution of which not only the interested élites but everyone is complicit. To recognise this is to dilute somewhat the pleasing dichotomy between élite commemoration and popular reminiscence. And equally it serves to dissolve the similarly simple distinction between (innocent) social memory and (complicit) academic history. Neither is as pure nor as purely manipulative as they are sometimes seen; both are constructs which have more than enough similarities in the way they are constructed, adapted and developed. This, of course, is not to reject the value of the study of social memory. It is instead to plead that it be approached in the same critical and self-critical spirit in which conventional history at its best is practised, even as that discipline, as it has so often before, develops its practices in the light of new methods. It is not the least of the achievements of Beiner’s admirably engaged approach that he encourages rather than inhibits this convergence. Ciarán Brady is Associate Professor of History at Trinity College, Dublin.